The holiday weekend looms with tributes and speeches celebrating one of the greatest and most influential speakers of the 20th century, Martin Luther King, Jr. MLK weekend is a wonderful observation, one that encourages reflection on where we have been, where we are, and just how far we have yet to go as an American people. But as we look ahead to a weekend of speeches, marches and remembrances, we should also remember that the March on Washington and other civil rights events were also filled with music: the music of hope, longing, suffering, and joy. This music, along with the poetry and literature of African Americans may be the initial impetus for change, one that became an accessible influence for people at far greater numbers than all the speeches, laws or social theories. Dr. King may have been at the head of this locomotive of change, but music and poetry were vital fuel for the engine. I was an infant when the March on Washington occurred, and although I don’t remember it, I nonetheless grew up with the legacy of the event. Dr. King’s speech was taught in school along with the entire Civil Rights Movement. But I also grew up with the legacy of music. Much of the music we listened to in the 1960s and 70s was but a short putt from whence it came. Not only R&B and Soul, but also Disco, which represented the upward mobility of a rapidly growing diverse middle class. And while none of this excuses or ignores racism and the continuing struggle for equality, it does give hope that what is really important is much closer than we think. So in this context, an orchestra concert may not be as out of the ordinary as it first appears. 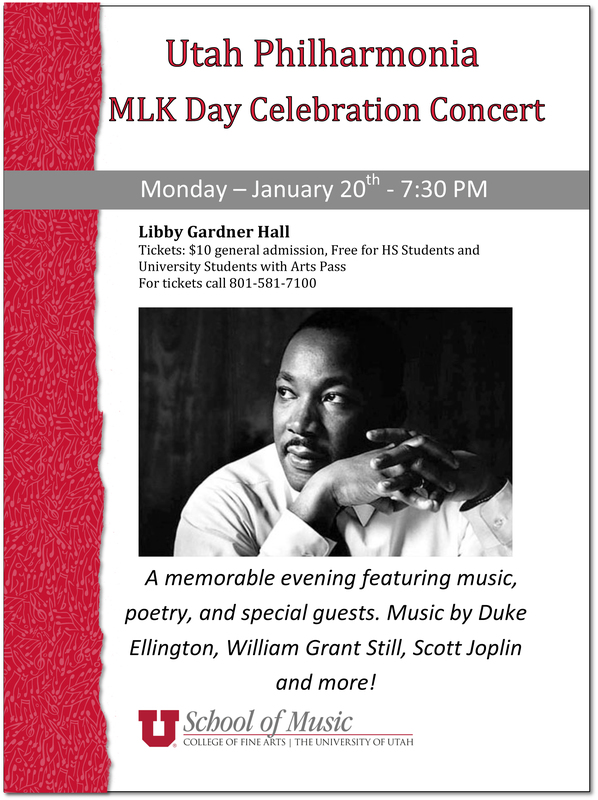 Using poetry and music the evening will be an expression of humanity through poetry and music. It has been an honor and joy to develop this hour-long program for the evening.